A Mumbai slum dwellers' delegation, which met Maharashtra chief minister Devendra Fadnavis, has demanded that the "cut-off date" approach for rehabilitating slum dwellers should be dropped, as it "protects" only limited number of slum dwellers. 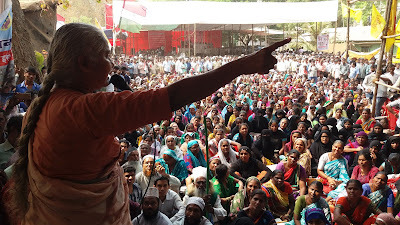 The delegation met Fadnavis following a 5,000 strong rally in South Mumbai area led by well-known social activist Medha Patkar under the banner of Ghar Bachao Ghar Banao Andolan, and submitted a list of demands for housing rights and basic amenities. Insisting that "life in the slums of Mumbai, which constitute more than 50% population of the city in the absence of ‘housing right’ has become pathetic", a the delegation regretted, "The concept of rehabilitation of slum dwellers through Slum Rehabilitation Authority of Maharashtra government is entirely pro-privatization and least pro-people." "A large chunk of public land gets privatized when it is handed over to the private builders to be exploited by them while rehabilitating the slum dwellers after demolishing their self-built structures to house themselves", it said. "This process of rehabilitation will surely make government lose all public lands which was earlier in the possession of poor people to few private builders", it warned. The slum dwellers, who marched from Carnac Bunder to Azad Maidan in Mumbai on April 5, demanded "scientific shutting down of the Deonar Dumping ground and a scientific waste-management system in the city." The delegation, which included representatives of National Alliance of People's Movements, Committee for Housing Rights, Pani Haq Samiti and veteran activist and CPI (M)’s Prakash Reddy, also demanded that the Maharashtra assembly pass a "no eviction order for slums and consider the legalization of self-built housing in the slums of Mumbai." It said, "This could be achieved by creating Special Housing Zones (SHZs) in areas currently occupied by slums." "People’s organization, NGOs and Government will work together with the inhabitants of each SHZ to improve basic infrastructure and social services", it added. Especially taking strong exception to "brutal and forced" evictions being carried out by Mangrove Cell of Maharashtra Forest Department, the delegation said,"The Mangrove Cell is taking action on the lands which the Government of Maharashtra has decided to constitute them as ‘reserved forests’. However, there is a long procedure of law to be completed first before the Mangrove Cell takes any action." Referring to the Bombay High Court order dated October 6, 2005 directing the Government of Maharashtra to "declare all mangrove areas and the areas within 50 meters of the mangrove areas as ‘protected forest’ (for government lands) and ‘forest’ (for private lands)", the delegation said, satellite mapping was carried out of the mangrove areas in Mumbai and Navi Mumbai with 2005 as the cut-off year. Pointing out that while there was "no question of identifying the areas in the maps which are before the year 2005", the delegation said, "The Mangrove Cell is not even sparing the slums which are protected by cut-off-date of January 1, 2000 set by Housing Department of the Maharashtra Government." "The Maharashtra government", it told Fadnavis, "Apparently in order to implement the order of the Court efficiently, decided to declare all mangrove areas as ‘reserved forest’. This was decided vide Government Resolution number S-10/2013/P.K. 64/ F-3 dated June 26, 2013."